With this product, you earn 54 loyalty points. 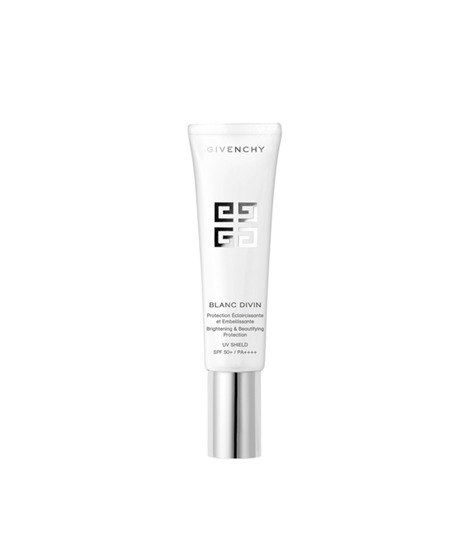 The star product of the Givenchy whithening range BLANC DIVIN, the UV Shield is today reinvented to boost its effectiveness. This hybrid formula combines the essence of the Glow Reviver™ Complex with reinforced 5D technology to provide the skin with a global age-defying benefit. In addition to providing protection, this product brings out the beauty of the skin from first application with mattifying micro-powders. Its rosy, refreshing, soothing formula delicately penetrates into the epidermis to release its protective and full brightening action. When used as a make-up base, it evens out the complexion for a flawless result! Apply a small amount in the morning to a perfectly cleansed face and neck, as the last step of the skincare ritual and/or as the first step of the make-up routine. The Givenchy Laboratories innovate by combining the brightening benefit of the Glow Reviver™ Complex with a 5D technology that helps protect the skin from the damage caused by UV rays.